Which is the easiest British shore bird to photograph? 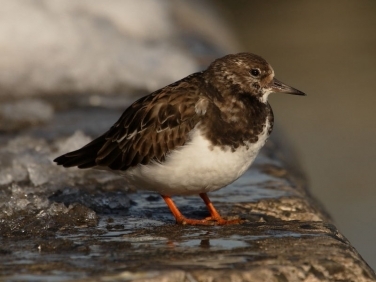 The Turnstone must be one of the most photographed shore birds in the world because of its confiding nature and habit of feeding around busy harbours seemingly unconcerned by people. No need for long lenses with this bird, many tourists these days merely snap away with their mobile phones! This bird was photographed at Cornwall’s Newlyn Harbour during yesterdays freezing conditions. It dosen’t seem to matter how many times I take pictures of these birds I still find it difficult to walk by one without having another go. In this shot, the ice spilt from the fish boxes contributed something different.